◆Q: What requirements foreigners have to meet to apply for the 72-hour transit visa exemption at Guangzhou Baiyun International Airport? A: (1) Citizens from the 45 countries under the 72-hour Transit Visa Exemption Program (The origins and destinations of travelers are not limited to such 45 countries); (2) Foreign nationals with valid international travel documents and air ticket for a connecting flight with confirmed date of flight and seat for a third country (region) leaving China at Guangzhou Baiyun International Airport within 72 hours; (3) The range of staying during the visa exemption is limited to the administrative precincts of Guangdong Province. ◆Q: What 45 are the countries? A: (1) 24 Schengen countries in Europe: Austria, Belgium, Czech Republic, Denmark, Estonia, Finland, France, Germany, Greece, Hungary, Iceland, Italy, Latvia, Lithuania, Luxembourg, Malta, Netherland, Poland, Portugal, Slovak, Slovenia, Spain, Sweden and Switzerland. (2) 7 other European countries: Russia, Great Britain, Ireland, Cyprus, Bulgaria, Romania and Ukraine. (3) 6 American countries: The United States, Canada, Brazil, Mexico, Argentina and Chile. (4) 2 Oceanian countries: Australia and New Zealand. (5) 6 Asian countries: Republic of Korea, Japan, Singapore, Brunei, United Arab Emirates, and Qatar. 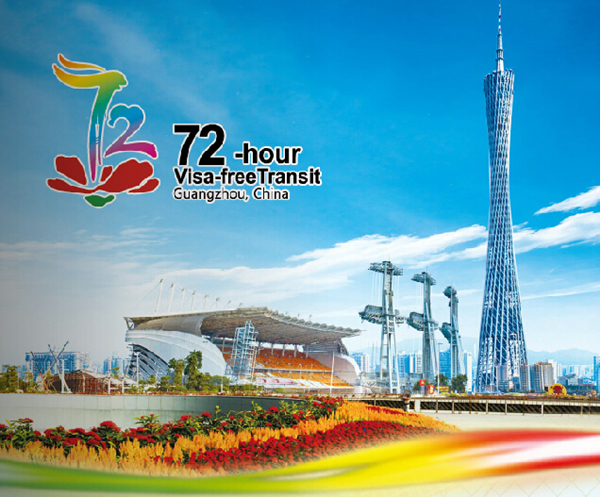 ◆Q: Is the 72-hour limit in the “72-hour Transit Visa Exemption” calculated by starting with the entry time? A: No. The 72-hour limit is calculated by starting with zero hour the next day of the traveler’s entry. For example, if a traveler enters China at Guangzhou Baiyun International Airport on August 1, 2013, the visa exemption limit for entry is calculated by starting with 00:00 on August 2, 2013. The traveler can leave China before 23:59 on August 4, 2013. ◆Q: How can a foreigner who meets the requirements for the 72-hour transit visa exemption apply for it? A: A foreigner that meets the requirements may submit his/her request to the airline company that carries him/her to Guangzhou, which shall make the application to the immigration of Guangzhou Baiyun International Airport that shall grant a temporary entry of a passenger meeting the requirements for transit visa exemption upon verification. Besides, a foreigner that does not apply for the 72-hour transit visa exemption before entry may submit his/her application to the immigration before completion of the immigration after arrival at Guangzhou Baiyun International Airport. ◆Q: Can a traveler apply for the 72-hour transit visa exemption when no exit air ticket is bought at the time of entry but he or she plans to purchase the air ticket for a third country leaving within 72 hours after entry? A: According to the requirements, a foreigner applying for the 72-hour transit visa exemption must hold the air ticket for a connecting flight with confirmed date of flight and seat for a third country (region) leaving China at Guangzhou Baiyun International Airport, i.e., the exit air ticket is already in place before entry. Therefore, this facilitation measure does not apply to a foreigner that does not have a confirmed air ticket for a connecting flight leaving within 72 hours. ◆Q: Does this measure apply to a foreigner coming to Guangzhou from a certain country (region) with a confirmed air ticket for flying back to the same country (region) where he or she comes from within 72 hours with confirmed date of flight and seat? A: According to the requirements, the 72-hour transit visa exemption measure is for a foreigner connecting through Guangzhou Baiyun International Airport for a third country or region. Therefore this measure does not apply to a passenger whose destination country is the country where he or she comes from. ◆Q: Can a foreigner leave Guangzhou Baiyun International Airport for another Chinese city after getting the 72-hour transit visa exemption? A: He or she may leave for the city in Guangdong and is not allowed to leave Guangdong. ◆Q: Can a passenger enter China at Guangzhou Baiyun International Airport and then leave from the Guangzhou East Railway Station within 72 hours? A: This measure is currently available at Guangzhou Baiyun International Airport only, which means that the travelers who enjoy the 72-hour transit visa exemption policy are only permitted to enter and leave China at Guangzhou Baiyun International Airport. ◆Q: What should be done in case a foreigner who has the 72-hour transit visa exemption cannot leave China within 72 hours due to some special reason after entry? ◆Q: If I have more questions concerning the immigration, how can I ask for an answer? Foreigners who visit Hong Kong and Macao can now easily go to anywhere in the Guangdong Province by obtaining a Convenient Visa for 144-Hour Stay. For 3 years, the visa used to allow foreigners to tour just "the Pearl River Delta", meaning cities consisting of Guangzhou, Shenzhen, Zhuhai, Foshan, and some other areas. The coverage of the visa has now broadened to the whole Guangdong Province. This simplified procedure of the 144-hour visa has already served many travelers for three years since 2004. Foreigners have to hold a passport issued by a country that has diplomatic relations with China. Also, they should be come in tour groups as part of a travel agency in Hong Kong or Macao. Even though this convenient visa only allows one a stay of up to 6 days in Guangdong, the visa is easy to obtain for a travel purpose. Many attractions in many Guangdong are not only beautiful but also historically valuable. With a convenient way to visit Guangdong, you can start planning your Guangdong travel in the near future. Sinotour provides you with travel information in Guangzhou tour guide.